the EAS Executive Committee wishes you a peaceful 2019 Easter and takes the opportunity to update you. January 31-February 1: The EU-funded project Dual Career for Women Athletes (DONA) kicked off in Istres (France). Coordinated by the Associació Esportiva Carles Vallbona and involving the Associação Aventura com Carisma-Leixoes Sport Club, the De SportMaatschappij Foundation, EAS (represented by Mojca Doupona and Joerg Foerster), the Malta Volleyball Association, the Scuola di Pallavolo Anderlini Soc. Coop. Sociale SD, the University of Ljubljana, DONA aims to envisage, develop, and test a dual career methodology at club level for empowering women’s volleyball player as students. 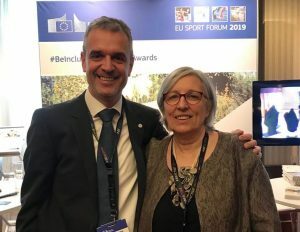 February 5: The EAS President laura Capranica attended the EU SPORTinfoday in Brussels, Belgium, which is the annual event to update on 2019 funding opportunities and EU priorities in sports (more information is available at: http://eacea.ec.europa.eu/home/erasmus-plus/actions/sport_en). February 6-7: The kick off meeting of the EU-funded Starting 11 project was held in Amsterdam, The Netherlands. Coordinated by the Amsterdam University of Applied Sciences and involving Allgemeiner Deutscher Hochschulsportverband (ADH), CREPS Toulouse, EAS (represented by Laura Capranica and Ole Keldorf), Sportlycée Luxembourg, Sports Aid Trust (TASS), Starting 11 aims to aims create a online European Dual Career Toolkit tailored to the specific demand of European dual career service providers. February 10-11: The University of Latvia (coordinator) organized in Riga (Latvia) the kick-off meeting of the EU-funded project More Than Gold (MTG), which involves the Alexandru Ioan Cuza University of Iaşi, EAS (represented by Laura Capranica and Mojca Doupona), the Fundación Universitaria San Antonio, the University of Chieti-Pescara “Gabriele d’Annunzio”, the University of Coimbra. Mojca Doupona Mojca Doupona (EAS Treasurer, University of Ljubljana) and Laura Capranica (EAS President, University of Rome Foro Italico). In particular, MTG aims to collect and systematize policies and best practices to develop Dual Career Guidelines and Methodologies for higher education institutions (HEI). This Collaborative Partnership will allow countries with partial (Italy) and limited (Latvia and Romania) dual career policies and services to take advantage from the experience of EAS and of countries where dual career is well-established (Portugal and Spain). February 18-22: The transnational meeting of the EU-funded AMID project was held in Rovaniemi (Finland), during which the activities related to dual career mobility measure for migrating athletes were updated. The project is coordinated by the University of Salzburg, and involves EAS (represented by Laura Capranica), the Lapland University of Applied Science, the University of Cassino and Southern Lazio, the University of Hamburg, and the University of Ljubljana. During the meeting, the proposal for the 2019 Collaborative Partnership Skills4Life was envisioned. 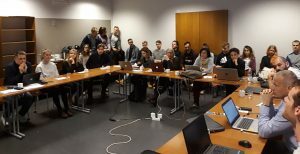 February 26-27: The coordinator of the EU-funded ED-MEDIA project, Lithuanian Sports University, hosted in Kaunas (Lithuania) the Partners of the Alexandru Ioan Cuza University of Iași; EAS (represented by Antonio Figueiredo e Ole Keldorf), the EUSA Institute, the German Sport University Cologne, the University of Ljubljana, the University of Rome Foro Italico, and the University of Valencia-Spain. The project aims to proactively act for changes in the attitude towards an athletes’ dual career by deliberately shaping a positive image of athletes as students. April 23-25: INSEP (Paris, France) will host the transnational meeting of the EU-funded project EMPATIA during which the contributions of France, Irish, Italian, Portuguese, and Slovenian parent of talented and elite athletes will be analysed to direct the development of a dual career parenting education programme. April 26-27: The Executive Committee will meet at INSEP in Paris (France) to discuss the past activities of EAS and prepare future plans and actions of our Network. May 7: The President of EAS, Laura Capranica, will take part in the EPAS Consultative Committee Bureau, in Paris (France). May 15-16: The meeting Expert Group on Skills of the European Commission will be organized in Lisbon (Portugal). EAS will be represented by Laura Capranica (President) and Antonio Figuereido (ExCom Member, neo ViceRector of the University of Coimbra). June 27-28 The transnational meeting of the EU-funded project More Than Gold will take place in Murcia (Spain). August 29-30: The transnational meeting of the EU-funded project Ed Media will take place in Ljubljana (Slovenia). September 10-11: The transnational meeting of the EU-funded project AMID will take place in Cassino (Italy). September 18-20, 2019 The University of Dalarna will host the 15th EAS Annual Conference in Falun (Sweden). => https://www.du.se/eas2019. This Conference is the dual career knowledge-hub of EAS members, EU-funded projects, and researchers. The Conference venue has been the home of Bengt Nybelius, which gives a special importance to the Bengt Nybelius Scholarship. The call for papers and more information are posted on the EAS website (www. dualcareer.eu). Member institutions, which do have an Erasmus-Charter, are able apply for staff- mobility funding throughout their international officies. They need to send the conference program with the application. They shall then contact the international office (Susanne Corrigox: sco@du.se) and Dalarna University will create an EARSMUS-agreement with the applicants. A special thank to the Executive Committee and the Members of our Network for their proactive attitude in the recruitment of new EAS members and the advancement of the European dual career culture. Therefore, I strongly encourage you to keep disseminating the EAS activities at local, regional and national levels. Due the Romanian presidency, on April 8-9 the European Commission organized the 2019 EU Sport Forum in Bucharest, which is a major EU assembly for the EU sports stakeholders and policy makers. The two-day event encompassed five plenary sessions (“Doping in Sport”, “The Role of Sport Federations in the Promotion of European Sport”, “Can Europe Still Attract Major Sports Events Europe?”, “Update on European Commission Activities”, and “How will Europeans Engage in Spirt in the Future?”) and six parallel sessions (“Are the Rights and Interests of Athletes Sufficiently Taken into Account by Sport Governing Bodies?”, “How Can Schools Better Contribute to the Promotion of Healthy Lifestyles?”, “Are sport rights sufficiently protected in the EU?”, “Why and How Should Grassroots Sport Be Financed?”, “Justice in Sport”, and “Challenges of Less Popular Sports”). The Forum presented another valuable opportunity for EAS to strengthen partnerships and to network with potential new partners. 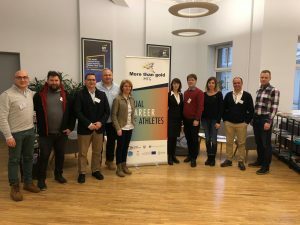 On February 26-27, 2019, the coordinator Lithuanian Sports University(Lithuania) hosted in Kaunas the Partners of the EU-funfed ED-MEDIA project (University of Rome Foro Italico-Italy;the European University Sports Association “EUSA” Institute-Slovenia; the Alexandru Ioan Cuza University of Iași-Romania; the University of Valencia-Spain; the German Sport University Cologne-Germany; the University of Ljubljana-Slovenia; and the European Athlete as Student “EAS” Network). The purpose of the project is to proactively act for changes in the attitude towards an athletes’ dual career by deliberately shaping a positive image of athletes as students, as well as encouraging sports organizations to pursue the implementation of the EU Guidelines on Dual Careers of Athletes. Overall, ED-MEDIA intends to boost a qualitatively attitude towards athletes as students and to encourage stakeholders to contribute to the improvement of conditions for athletes at the individual (e.g., the athlete), organizational (e.g., sports organization), and policy levels. EAS is represented by its ExCom Members Ole Keldorf (ESAA) and Antonio Figueiredo (University of Coimbra). On January 31 and February 1, 2019. The EU-funded Dual Career for Women Athletes (DONA) projectkicked off in Istres, France. DONA aims to empower women’s volleyball players by investigating, developing and testing a dual career methodology at club level. 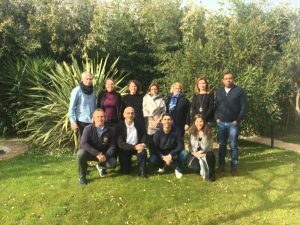 It is coordinated by the Associació Esportiva Carles Vallbona (Spain) and involves the Malta Volleyball Association (Malta), the Scuola di Pallavolo Anderlini Soc. Coop. Sociale SD (Italy), the Associação Aventura com Carisma – Leixoes Sport Club (Portugal), the De SportMaatschappij Foundation (Netherlands), the University of Ljubljana (Slovenia), and the European Athlete as Student (EAS) Dual Career Network (Malta). To cover the several important development stages that encompass relevant changes at academic, athletic, psychological, social and professional levels, DONAtargets arounf 250 female volleyball athletes between 12-20 years old. Upon the development of a dual career methodology, a Dual Career Club Management (DCCM) unit will support and help the players throughout a 3-semester pilot programme, whereas the volleyball clubs will create an optimal DC environment in cooperation with educational institutions. · prepare these athletes for their upcoming challenge to be successful in the change from elite sport to labour market – for the “career after the career”. 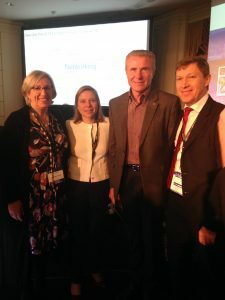 Mojca Doupona (EAS Treasurer, University of Ljubljana) and Joerg Foerster (EAS Secretary, German University Sport Federation-adh) represent EAS in the project. 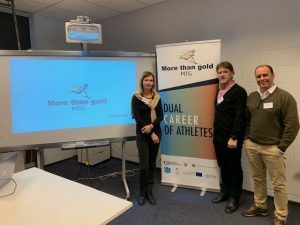 On February 10-11, 2019, the University of Latvia (coordinator) organized in Riga (Latvia) the kick-off meeting of the EU-funded project More Than Gold (MTG). The project involves the Alexandru Ioan Cuza University of Iaşi (Romania), the Fundación Universitaria San Antonio (Spain), the University of Coimbra (Portugal), the University of Chieti-Pescara “Gabriele d’Annunzio” (Italy), and the European Athlete as Student network (Malta). Mojca Doupona Mojca Doupona (EAS Treasurer, University of Ljubljana) and Laura Capranica (EAS President, University of Rome Foro Italico) represent EAS in the project, which involves also the EAS ExCom Members Ivis Albertans (University of Latvia) and Antonio Figueiredo (University of Coimbra). To contribute to the development of a dual career culture in Europe, the project aims to collect and systematize policies and best practices to develop Dual Career Guidelines and Methodologies for higher education institutions (HEI), especially in countries where Dual Career policy is at early stage. Thus, the MTG academic institutions from countries with partial (Italy) and limited (Latvia and Romania) dual career policies and services will profit from the experience of MTG universities of countries where dual career id well-established (Portugal and Spain). Furthermore, EAS will provide a broad European dual career experience. 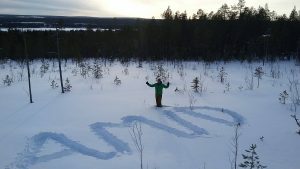 On February 19-22, the Lapin AMK University of Lapland hosted the third transnational meeting of the EU-funded AMID project, which aims to promote and implement dual career, especially targeting athletes migrating for sport, academics or both. The Head of International office of Lapland AMK welcomed the Coordinator (University of Salzburg – AUT) the Partners (University Sport Service Hamburg – GER; Lapland University of Applied Sciences – FIN, University of Ljubljana – SLO, University of Cassino and Southern Lazio – ITA, and EAS – MLT), and the students to be involved in discussions. The Partners have illustrated the recent activities and findings, future steps, schedule, and dissemination activities. Mr. Juha Dahlström from the Finnish Olympic Committee participated in the meetings of the last two days, which also included a discussion on the opportunity to develop a skill-based educational curriculum for a full recognition of the informal education through sports. How can sport clubs support a talent’s Dual Career? In creating the www.icdc.eu pilot program not only scientific sources were consulted. Best practices in Dual Career have also been researched. To identify the best practices in Dual Career, work visits have been paid to Olympic Committees, elite sport centers, elite sport clubs, schools / universities and other institutes. At all these organisations key players (amongst others managers, coaches, Dual Career support providers, athletes, etc.) have been asked their opinion on effective Dual Career support in sport clubs. 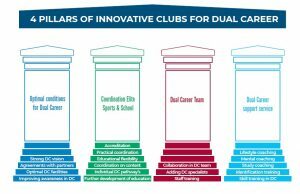 The project “Innovative Clubs for Dual Careers” focuses on developing optimal conditions for Dual Career and improve the Dual Career awareness at sports clubs, good coordination regarding education and sports clubs, developing a Dual Career team with specialists and corresponding Dual Career support. These are the important pillars of the project and in the study we have focused on successful practical examples that focus on the aspects of these pillars. 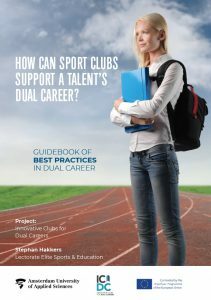 Given the fact that the Dual Career concept is not always firmly anchored in sports clubs, inspiration was deliberately sought in other domains and organizations as well. The starting point has always been that a working method or structure can easily be integrated into the practice of a sports club. The 4-pillar scheme shows the pillars underlying this project and therefore also the study. Each pillar is further explained in a chapter in this guidebook. For each pillar, relevant scientific insights are discussed and the best practices that form the basis of the pilot programme and can inspire more sports clubs to professionalize their Dual Career policy are explained. Each building block in each pillar represents a paragraph of that chapter. Each chapter concludes with a best practice in which the most important elements of the pillar are highlighted in ‘In the spotlight’. These highlighted best pratices together form the Champions League for sports organisations in Dual Career! On February 12th 2019, the University Sport Centre of Padova (CUS Padova) hosted the Kick-off meeting of “Sport Opens School”, the project that aims to enhance the teaching of physical education in high schools, taking advantage of the positive role that sport can play as a tool for education and as a catalyst for positive universal values. Funded by the Erasmus+ Program of the European Union, “Sport Opens School” is a two-year project which will involve four high schools called to act as “pilot”: “Newton – Pertini” Institute of Higher Education in Camposampiero (Italy), Budapest VI. Kerületi Kölcse y Ferenc Gimnázium (Hungary), Liceul cu Program Sportiv Bacau (Romania) and Instituto N.ª Sra da Encarnação – Cooperativa de Ensino, Benedita (Portugal). The goal to be achieved is the creation of an innovative teaching module that physical education teachers will experiment in the pilot schools to increase the participation of teenagers in sport. The new teaching module will be based on three main pillars: health education; fair play education; and development of skills and abilities necessary for the personal fulfilment of young people and their future employability. The quality of the new teaching program is guaranteed by a multidisciplinary team of trainers made of representatives of the European Athlete as Student network (EAS), the Italian National Olympic Committee (CONI), the School Inspectorate of Bacău County (ISJ Bacau) and CUS Padova, as well as, by a participatory approach that will allow teachers of physical education and their students to be directly involved in all stages of implementation. The Kick-off meeting in the University sport facilities involved Laura Capranica of the European Athlete as Student network (EAS); Marianna Pavan, Daniela Drago and Mario Massimo Ferrarese (CONI – Italy); Ana Maria Rotaru and Mihaela Frant (ISJ Bacau – Romania); José Vinagre (ECB – Portugal); Szilvia Ferenczi (KFG – Hungary); Annalisa Caicci (Newton-Pertini – Italy); Francesco Uguagliati, Marta Gravina, Riccardo Garavello, Laura Brazzarola, Carlo Frangioni (CUS Padova – Italy). Kick-off-Meeting of EU funded “Dual Career” project. “STARTING 11” took place at Amsterdam University of Applied Science (AUAS) at 6./7. February. Aim of the project is to develop tailored tools to the specific demand of dual career service providers in the EU member states. Using an integrated approach, STARTING 11 empowers key actors in sport, education and the labour market to provide high quality services to athletes in all stages of their sporting career, reaching from school level to the stage of retirement from sport. EAS is represented in that project by Prof. Laura Capranica (Foro Italico) and Ole Keldorf (Eliteidraet Scole Aarhus – ESAA). ANTI-DOPING is a serious aspect of Dual Career framework and so EAS is looking forward to the results of the GAME project, which probably can contribute to other researches and projects in the field of Dual Career. The EU funded project GAME took place in Kaunas for its second project meeting on 22 and 23 November 2018.
c. cutting-edge serious gaming design and technology in order to deliver an innovative and impactful anti-doping educational intervention. • It will provide a serious game that is expected to reach wider audiences than typical anti-doping education campaigns. • It will utilise an innovative educational approach in teaching adolescents and young athletes. • It will produce a report on evidence-based policy recommendations in order to improve existing policies against doping in amateur sport. ENAS, which is a partner of EAS, will take a disseminating role in the GAME project and will explore what anti-doping measures are in place in Universities and Colleges around Europe in a professional as well as recreational context.